Soccer requires a combination of different fitness attributes, including speed, coordination, agility, strength, power, and endurance. 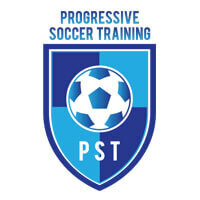 Resistance training or weight lifting can play a significant role in your soccer aspirations if used properly. 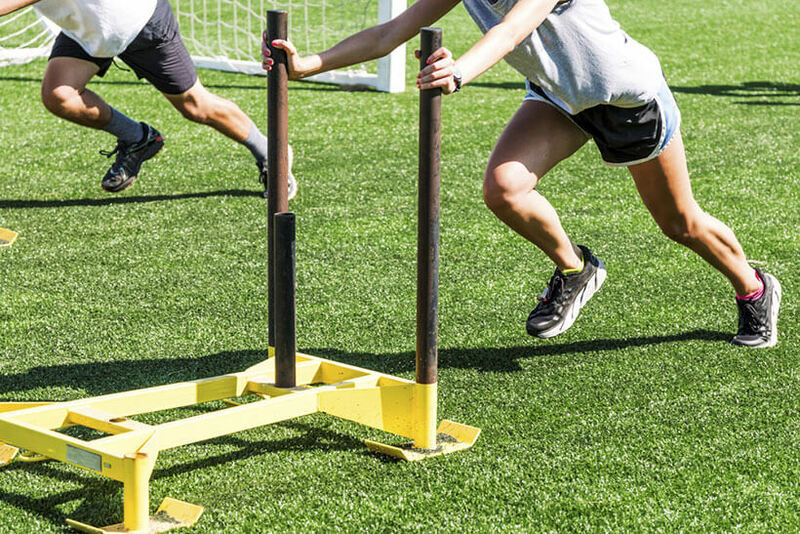 The best soccer training programs will always include some kind of weight training, making sure to prepare your body for the pitch. Playing soccer would be easy if it only required strength, for example, or speed. In reality, soccer demands a complete athlete, well versed in all areas of physical fitness. 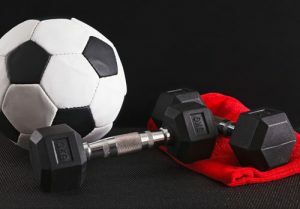 If you’re just starting out with your weight training for soccer, you should definitely check out this post and get some basic outlines of the key fitness areas you should focus on for optimal soccer performance. Muscular endurance is the ability to perform repeated movements with almost maximum effort without fatigue. Muscular endurance is best achieved with multiple sets of 15-20 reps and with short 30-60-second breaks. Since your legs feature the most-used muscle groups, you’ll want to focus on your hamstrings and quadriceps. Recommended exercises include lunges, bodyweight squats, leg curls, leg extensions, leg presses, high-box step-ups, etc. Strength is the ability to generate force in a short period of time. Strength comes into play once you start defending against the opposing players who are trying to push you away from the ball. This can happen on the ground but also in the air. Strength is achieved by lifting heavier weights at lower reps. Determine your one-rep maximum and start lifting 90% of that weight for 3-5 reps. Exercises like squats, bench press, shoulder presses, and deadlifts are all ideal for strength development. Power is simply your strength expressed at speed and it’s essential for your ability to sprint or jump. Building up power in the gym is done with explosive movements, using the weights you’re able to lift at full speed. Not all movements are suitable for power training due to the velocity required. Power training routing includes dumbbell snatches, barbell clean and jerk, squat jumps, and overhead medicine ball throws. Before even attempting to do these exercises, you should definitely be comfortable with basic conditioning techniques since you’re running a risk of injuring yourself if you’re not completely ready. Focus on your legs, neck, and chest before anything else. These parts are most prone to injuries with soccer players, so build your strength there and always warm up before the practice. Do not bulk up too much. Remember, you are not a bodybuilder, you are a soccer player. Too much weight training without proper conditioning will make you considerably slower since you won’t be able to handle all that muscle mass properly. At the end of the day, don’t let fitness and weight training move your focus away from practicing your soccer skills. Maintain your running/sprinting speed and conditioning at all costs.